A 20-year-old man who was armed with a knife and a machete in Selkirk town centre and told passers-by there was going to be a bloodbath has been jailed for more than a year at Jedburgh Sheriff Court. 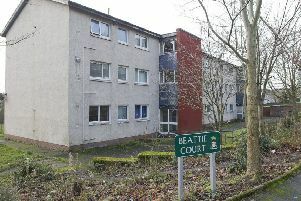 Twenty-year-old Phillip McMillan – who told police he was “off my nut on valium” – was involved in a late night altercation with four youths in High Street, Selkirk, on the night of February 3. McMillan then struck the wall with one of the weapons close to one of the female’s head. The court was told police arrived on the scene and found McMillan underneath a car in the Sainsbury’s car park with the weapons lying discarded on the ground. He was abusive to police officers, saying he would hunt them down on their day off and kill them. Procurator fiscal Graham Fraser said McMillan, formerly of Back Row, Selkirk, had consumed three bottles of Buckfast along with blue tablets. McMillan pleaded guilty to charges of threatening or abusive behaviour and possession of bladed articles in public, as well as various breaches of bail. Defence lawyer Ed Hulme said his client had little recollection of the events on the day in February. Sheriff Peter Paterson said there was no alternative to a custodial sentence, highlighting the combination of possession of weapons, along with McMillan’s state of intoxication through drink and drugs. He imposed jail sentences totalling 388 days back-dated to November 13 when he was remanded in custody.